The current genocide in Yemen is the worst of the 21th century. The state media blame the supposed civil war in Yemen or Saudi Arabia, but in reality it is another genocide orchestrated by the United Nations, World Bank, IMF, Britain, UAE and Saudi Arabia. The international community in their greatest philanthropic disguise provides the starving Yemenis with vaccines. I’ve been collecting this information since March 2017, so this first post is a huge one. 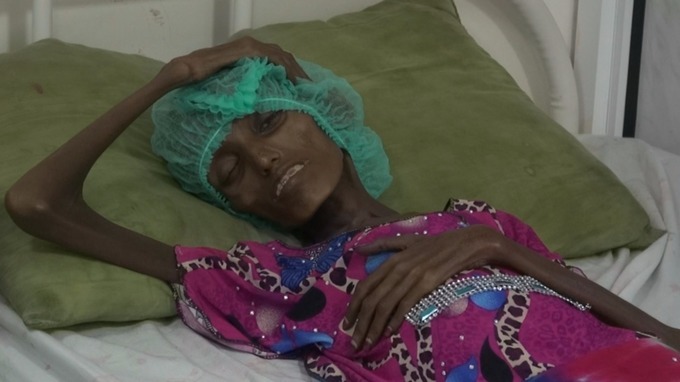 The people of Yemen are literally starved to death, by a blockade and bombing by Saudi Arabia that started on 25 March 2015. With the support of the government of Britain, the USA, and the terrorist United Nations. 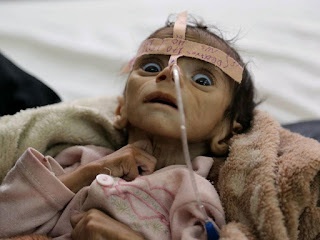 This is what Yemeni children looks like, dying of starvation. Here is a 10:50 video that shows the effects of the UK/US/Saudi led “coalition” war against Yemen. And a protest in Sanaa blaming the US government for selling weapons to the Saudis, but not the American citizens. Here’s a video by Oxfam on what is happening in Yemen. In early 2011, the people in Yemen started demonstrations against the corrupt dictatorial regime. President, dictator Saleh eventually resigned in favour of his vice president, endorsed by the USA and Saudi Arabia, Mansour Hadi. Hadi ran for president in 2012 and won the election — he was the only candidate. This failed to mollify the Houthis. In September 2014 they marched into Sanaa and placed Hadi under house arrest. For many years, the Kingdom of Saudi Arabia has bought large amounts of weapons - bombers, bombs, and missiles – from the USA, Britain, France, and other NATO countries. Saudi Arabia bought 84 Boeing F-15‘s, 170 helicopters, bombs and missiles (including 1300 cluster bombs sold by Textron for $641 million) for a total of $60 billion: that was the largest arms sale in US history. The United Nations passed a Security Council resolution that demanded the unconditional surrender of the Houthi Ansarullah movement. On 25 March 2015, the Royal Saudi Air Force went into action. Six days later, the Saudi-led coalition imposed a blockade of Houthi-held areas. The Houthis were proclaimed terrorists for fighting against the dictator favoured by the “international community”; they also claimed that the Houthis are connected to Iran. The USA supplied “logistical and intelligence support” to the “coalition”, including training, intelligence, while US Navy ships aided in the blockade. Before the blockade, Yemen imported more than 90% of its food, fuel, cooking gas, and medicine. The effect of the blockade is devastating, and is worsened by the bombs (including carpet bombs and phosphorous bombs) that target infrastructure and agriculture. I witnessed about a thousand air strikes. Some of them were very close. I almost burst my eardrum in one. Let’s be very clear, the civilian targeting is absolutely astounding. I’ve seen hospitals, mosques, marketplaces, restaurants, power plants, universities, residential houses, just bombed, office buildings, bombed. Everything is a target. In Saada, there were dead donkeys on the side of all the main roads because the Saudis were hitting donkey carts. In Hajjah, the water tank in one of the towns got hit, and it sits on a lonesome little hill. The result of the blockade and the bombing is that 7 million of the country’s 27 million population is on the verge of starvation. The number of food insecure people in Yemen has risen by three million during seven months. More than 17 million Yemenis are forced to skip meals. The UN International Children's Fund (UNICEF) warned that 462,000 children are suffering from acute malnutrition in Yemen. UNICEF said that at least 370,000 children are at risk of severe malnutrition, and without urgent treatment will die. An estimated 1.5 million children are malnourished. According to statements from the UN, over 14 million Yemenis (more than half the population) are now living in hunger. The threat of mass starvation is compounded by a rapidly spreading cholera epidemic. In other words, with the aid of the developed world, Saudi Arabia and its allies are starving an entire population – that’s genocide. Already in April 2015 (that’s more than 2 ½ years ago!) the food supplies across Yemen were running out, and petrol stations empty. Because the blockade continues, the country’s food shortage has become even more severe. A lot of reports, based on information of the UN, state that “more than 10,000” civilians in Yemen have died because of the bombs by Saudi Arabia. Much more than that is dying because of starvation. At least one child dies every 10 minutes in Yemen. More than 6 per hour. More than 144 per day. More than 1000 per week. More than 4320 per month. More than 52,500 per year. See 2 Yemeni girls, dying of hunger. The few stories about this catastrophe often call for “health care”. You don’t need to be a medical “doctor” to understand that people on the verge of starvation need food (instead of doctors). Following is a June 2017 overview of the destruction of Yemen by the “coalition” strikes. 2.5 million - people displaced. 404.485 - Houses destroyed and/or damaged. 1733 - Bridges and roads destroyed. 162 - Electrical power plants destroyed. 294 - Health facilities destroyed. According to the official numbers a total 12.574 people have been killed. In reality more than 1000 Yemeni children die every single week (does throwing bombs on the food supply and water not count as a violation of international humanitarian law?). 1784 - Agricultural fields destroyed. 221 - Poultry farms destroyed. 676 - Food stores destroyed. 528 - Food tankers destroyed. In the night of 22/23 August 2017, starting at midnight, the UK/US-led coalition carried out a bombing campaign of at least 25 air strikes on the outskirts and north of the capital of Yemen, Sanaa. At least 35 people were killed when a hotel to the north of Sanaa, which housed mainly QAT-farmers, was destroyed. Some sources claim that the death toll is at least 60. According to a report by the Protection Cluster in Yemen (part of the UNHCR), there were more air strikes in Yemen from January to June 2017 (5,676) than in the whole of 2016 (3,396). According to the Protection Cluster, 14 million Yemenis are food insecure and don’t have access to clean water (more than 50% of the population) of which 8.2 million are in acute need of help. In July 2015, the Guardian already wrote that 20 million Yemenis are in need of aid. Most people in the “civilised” world don’t even realise what it’s like to have no clean water to drink. Yemen has a strategically important position, with harbours that could ship oil from the Middle East further east into Asia, while it is also strategically located near Africa. I have read an interesting interview with Hanan al-Harazi from August 2015, who could escape Yemen because her family had foreign passports. Nobody is issuing visas to Yemeni nationals so this means 23 million people are trapped inside a country that is being mercilessly and indiscriminately bombed with complete disregard for civilian life (Yemen is part of the banned countries by Trump’s Executive Order). Saudi Arabia tries to bomb Yemen into submission. When this didn’t succeed they continued with this brutal, horrific, cruel, vicious blockade on Yemen in the hope that the Yemeni people will turn against those who are fighting the Saudi invaders. Not many people know that the problem of not having energy resources is enormous, because without diesel or electricity, water cannot be pumped from underground reservoirs. In Amran and Lahj, they have targeted food markets and livestock markets — to starve Yemenis. The mainstream media have ignored that internationally banned weaponry was used in Yemen. The use of cluster bombs is well documented; some have failed to detonate and were photographed on the ground. In the densely populated civilian area called Faj Attan, weapons of mass destruction were used. Why was this exempted from investigation? There are areas in the South, like parts of Hadramaut, which are under total control of Al-Qaeda. Strangely the bombs are falling on the people that are fighting these extremists. Not a single bomb has been dropped on the extremist strongholds. Obviously the “coalition” is not fighting against Al-Qaeda. That Yemenis knew that our long-time dictator “Ali” Abdullah Saleh gave priority to the Saudi interests over that of Yemen, led to the 2011 revolution to get rid of him. Jamal Benomar, the former UN peace envoy to Yemen, has confirmed that just as the warring factions, including the Houthis, were reaching an agreement (the Peace and Partnership Initiative) - Hadi suddenly didn’t want Ansarullah to have even marginal representation in government (ordered by the Saudis). This was not going to be acceptable to Ansarullah. Hadi was placed under house arrest because he was following Saudi instructions. Saudi Arabia was against Ansarullah’s inclusion in Yemen’s government. Then Hadi fled to the south, and then on 25 March 2015 the war started. They want to split Yemen into six-federal-states. When they devised the six-state system, they deliberately isolated one state, Azal, without resources or access to the sea. It was a blatant imprisonment and suppression of that area. Iran is not playing an active role. Iran’s supposed “support” is only a propaganda ploy for the Saudis/imperialists to justify hitting Yemen. In August 2005, the Yemen Liquid Natural Gas (YLNG) project in Balha was being developed by a consortium led by France’s Total (39.62% shareholding); US company Hunt Oil (17.22%); South Korea’s SK Corp (9.55%), Kogas (6%), Hyundai Corporation (5.88%); Yemen Gas Company (6.73%), and the General Authority for Social Security & Pensions of Yemen (5%). There are reasons to believe that Saudi Arabia is a spend force in oil exports, and needs to plunder Yemen (and other states) to keep up. If the people find out that they have squandered the oil profits, the Saudi regime could be in a lot of trouble. It’s no coincidence that the Saudis are killing people in the same Jawf region where the oil and gas basins were first discovered and explored by Hunt Oil, Exxon. British Gas and the United States Geological Survey (USGS) have known of the vast oil and gas deposits offshore of Yemen for some time. A 2002 USGS report shows that there is an immeasurable potential, while numerous explorations show vast oil reservoirs and potential around Yemen. A WikiLeaks cable dated 1 December 2008, from Ambassador Stephen A. Seche, shows that the Bush administration knew that Yemen was “PUSHING FULL STEAM AHEAD ON GAS PRODUCTION". Maybe this shows that they figured that something must be done to stop the Yemeni government. From 28 February to August 2017, the USA carried out roughly 80 airstrikes in Yemen. In August 2017, US troops helped the United Arab Emirates (UAE) army and Yemeni militias loyal to Abu Dhabi with "intelligence sharing" to invade the Shabwa province in the southeast of Yemen, where there’s a large reservoir of gas (and oil). The UN has launched a campaign in February 2017 to vaccinate 5 million Yemeni children with polio, with the help of the World Bank, UNICEF and WHO. The World Bank is committed to investing in children’s health, which is a vital investment in the country’s future, through working with our UN partners in Yemen and strengthening the local health institutions. According to the UN “Vaccination is one of the safest and most cost effective health interventions to protect children from potentially fatal and debilitating diseases”. Do I understand correctly that according to the state propaganda, because of these magical “vaccines”, Yemenis don’t need food and clean water anymore?!? Since June 2017, the international community have provided Yemen with more than one million doses of an oral cholera vaccine for urgent use. There is at least one death every hour caused by severe dehydration and diarrhoea. International health officials say the emergency vaccinations are necessary to contain the cholera epidemic in Yemen. The vaccine can only be administered to those who don’t have cholera yet. In August 2017, the Houthi “rebels” still had some control over one port through which (possibly, hopefully) food can reach their part of Yemen – Hodeidah. The UK/US-led “coalition” has done everything they can to make it impossible to import food through this port, and by now have effectively blocked it completely (blaming Iran and Saudi Arabia). The city of Hodeidah has also been attacked. A UN official warned that up to half a million civilians could be displaced if the conflict in the country's southwest escalates. On 16 March 2017 at about 9 PM, a helicopter opened fire on a boat carrying (mostly) Somali civilians some 50 km (30 miles) off the coast of Hodeidah, killing more than 32 people (including a Yemeni civilian) of the 145 on board. Another 29, including 6 children, were wounded, and 10 more remain missing. All the parties involved, have denied responsibility for the attack, including the US and Saudi Arabia. Here’s a photo of some of the corpses after the attack on the boat. In the first week of July the airstrikes by the “coalition” continued. Including attacks on the city port Hodeidah. 	Accomplishment of structural reforms in the security sector. The IMF and World Bank have been helping Yemen to destruction since at least the 1990s. First a short summary of this strategy. Decrease subsidy, so what’s left of the economy will collapse, but on the other hand increase the spending for hospitals and education (so that only the good slaves will survive). Following are some excerpts that shows the strategy of IMF and World Bank for Yemen. the intensive civil unrest following the June 1998 increases in administered prices pointed to the need to enhance public awareness of the reform program to ensure that further progress on reforms is not delayed. the taxpayer identification number system (TIN) will be extended beyond the current range of major taxpayers to medium- and smaller-sized contributors and will be enforced through penalties for non-observance. In addition, the need for computerization to enhance the effectiveness of the TIN's use will be reviewed. To support this effort, trade in pharmaceuticals will be delegated to the private sector by eliminating the government procurement monopoly effective by the year 2000. Accordingly, the reform program over 1999-2001 will include specific steps aimed at advancing reintermediation in a competitive market environment and in particular to unblock the loan recovery process. Measures such as requiring that all court decisions be made in writing and published promptly, strengthening enforcement through introduction of a bailiff system, establishment of a quantitative system for monthly monitoring of court operations, and reducing the fee for filing a case in court will be considered. The delinquent borrower notification system implemented in 1997 will be continued. And it’s not only the bombing and blockade that finishes the destruction of Yemen. The situation is in turn used as an argument to stop the “humanitarian” aid to Yemen. The banks simply block the transfer of money to import food! In July 2016 importers couldn’t import food to Yemen, because more than $260 million of their credit couldn’t be transferred to foreign bank accounts. 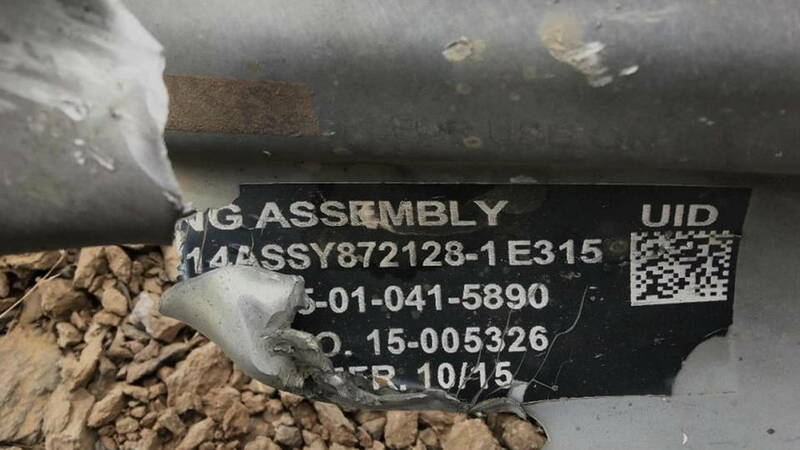 The following picture shows a remnant of a wing that was part of a 500-pound bomb found at the Arhab water drilling site, Sanaa governorate, where at least 31 civilians were killed in an airstrike on 10 September 2016. It was produced by US defence contractor Raytheon in October 2015. Erik Prince is best known for founding Blackwater (which has been renamed Xe Services), which had a shoot first, ask questions later when “democracy and freedom” was brought to Iraq. These days Erik Prince is making hundreds of millions of dollars with his new company Reflex Responses (R2) by training mercenaries for the UAE (used against Yemen). From February 28 till the beginning of April 2017, the US military carried out 70 airstrikes on Yemen, double the total for 2016. The strikes were mostly carried out by drones and targeted: fighters, infrastructure, fighting positions and equipment. We continue to target Al-Qaeda in Yemen, and this is done in the interest of disrupting this terror organisation that presents a very significant threat to the United States. Since February 28, we’ve conducted more than 70 precision airstrikes against AQAP militants’ infrastructure, fighting positions and equipment. Jared Kushner, President Trump’s son-in-law and senior adviser, picked up the phone during a meeting with Saudi officials and called the chief executive of Lockheed Martin, Marillyn A. Hewson, over a $110 billion arms deal with Saudi Arabia. The government’s view is absolutely clear, that what Saudi Arabia is entitled to do is to defend itself from these attacks across its own border. It’s had—its cities in the south of Saudi Arabia have been shelled by the Houthis. It’s perfectly entitled to defend itself. And it’s also leading the coalition to restore the legitimate government of Yemen. In January 2016, Saudi Arabian foreign minister Adel al-Jubeir had a meeting with British ministers and US secretary of state, John Kerry. After this meeting Jubeir told reporters not to worry about violations of international humanitarian law, because British and American military officials are in the command and control centre for Saudi airstrikes on Yemen. Jubeir said that Saudi Arabia’s partners are satisfied with the protection of civilians. He used comments by British minister Philip Hammond, who the same week told parliament that British officers are working with the Saudi military to make sure they don’t violate international humanitarian law. The Campaign Against the Arms Trade (CAAT) has started legal proceedings against the UK Department for Business, Innovation and Skills, which has approved export licences for the weapon sales to Saudi Arabia, accusing it of failing to prevent violations of international humanitarian law. The issue is extremely finely balanced, but I judge at present the Saudis appear committed both to improving processes and to taking action to address failures/individual incidents (...) the clear risk threshold for refusal … has not yet been reached. Mmy home country the Netherlands is also involved in this clear example of genocide. There is information (from a report from 2015) that arms are sold from or shipped through the Netherlands to countries involved in the war against Yemen. The Netherlands is involved in (lots of) exports to the United Arab Emirates (UAE). Components and grenades in 2006, 2013, 2014. Components of radar- and radar fire control systems in 2004, 2005, 2006, 2007, 2014. Components of rocket launchers in 2009. Ammunition in 2010, 2012, 2013, 2014. Components for guided projectiles in 2012. Parts and components for F-16 fighter jets in 2014. Naval equipment for Sea Sparrow Canister in 2014. Components of F-15 fighter jet engines in 2007. Components of military communication systems in 2007. Communication systems in 2008, 2009. Communication systems for tanks in 2009 (more orders expected). Portable surveillance radars in 2009. Components of armoured vehicles in 2010. Components for Typhoon and F-15 fighter jets in 2013. Armoured Lexus LX570 in 2014. F-16 fighter jets in 2009. M109 Howitzer tanks in 2010. Ammunition in 2010, 2013, 2014. Armed armoured vehicles in 2013, 2014, 2015. Maverick air-ground missiles and supplies for F-16 in 2015. DAF trucks and DAF components in 2015. More arms planned to be delivered in April 2016. Guided anti-tank weapons in 2005. Components of radar fire control systems in 2006, 2007, 2008, 2009, 2012, 2013, 2014, 2015. Thermal imaging cameras in 2008. Components for armoured vehicles in 2009. When the armed conflict in Yemen broke out in 2015, the Dutch state secretary of justice decided to suspend decision making in Yemenite asylum cases, by declaring a so-called “moratorium”. Bizarrely almost no refugees from Yemen ever reach the EU. All in all, when compared to the famine, and bombing, there is only a small amount of refugees that have escaped Yemen. About 170,000 people have fled Yemen so far (written in March 2016), mostly to Djibouti, Ethiopia, Somalia and Sudan (and even Saudi Arabia). This is “small” compared to the millions that have escaped Syria, where the humanitarian drama isn’t as bad. In September 2015, the EU agreed upon a plan, under which refugees (mainly from Syria, Iraq and Eritrea) be distributed around Europe to relieve the burden on the frontline states of Italy and Greece. Of the agreed upon 160,000, in May 2016 only 1,441 were moved, while some European states are contesting the proposal. Yemenis are not in the top 30 nationalities seeking asylum in the EU in 2015. More than a quarter of those that applied for asylum were denied entry. The 20-year-old Yemeni Waleed al-Shaibani arrived in Greece and then applied for asylum in Poland. Poland initially accepted him, but after having to wait for 2 months in Greece, Poland suspended the refugee programme, and refused to accept Waleed. Then he asked the Greek asylum service to be relocated elsewhere, but was informed that Yemenis were no longer eligible for the programme. We went to the IOM and asked if they can repatriate us, but they said they cannot because it's not safe. So our country is too dangerous for them to send us back, but not dangerous enough for Europe to accept us. Sometimes I can’t really tell the difference between “genocide” and “fighting terrorism”. Much of your report relies on mainstream media sources and, indeed, reads like one. How do you justify your style of research, which merely cites moneyed media monopolies for proofs? Banking is certainly a reprehensible organization that every country apparently clamors for, and I don't doubt the IMF may be used by empire (or vice versa). But how can you let your views be propped up solely by huge lying organizations? Have you been brave enough to analyze any of the pictures you wish to use for emotional manipulation? Can you be certain the demonization of Arabic, pseudo-Arabic or "Middle Eastern" countries (as horrific as states may indeed act) is not the long game in the reporting trend? I could make a "report" of 9/11, claiming the government's most absurd version is correct by simply compiling links to mainstream reports like BBC, Reuters and Associated Press. It would not erase the contradictions and lies of that propaganda. As horrible as the crimes of empire are, what can be relied on in your alarmism and your obvious desire for us to let your cherry-picked pieces go completely unquestioned/gawked at/emotionally reacted to? Your interest in coming to CluesForum should be aligned with the principles of investigating all media claims, especially those using the technologically advanced manipulative tools of mass global distribution of text, story, video and photo-like imagery. In what way have you demonstrated an ability to question the world view that you've stacked up based on corporate military-intelligence style reporting? Before you accuse me of having a bias or opposing you for opposition's sake, please consider all my questions authentic (i.e. ; not sarcastic or snarky) questions worthy of being asked of all of us trying to find truth these days. hoi.polloi » January 22nd, 2018, 5:16 pm wrote: Much of your report relies on mainstream media sources and, indeed, reads like one. How do you justify your style of research, which merely cites moneyed media monopolies for proofs? I guess that you're missing the point - according to mainstream media a total of something like 13,000 Yemenis have died since March 2015. This narrative is basically supported by both mainstream and alternative media (I really can't tell the difference). According to the Western media, Iran is to blame for supporting the Houthis. Iran couldn't even get weapons to Yemen if they wanted to, because it is blatantly blocked. According to some "alternative" media, Saudi Arabia is to blame. In reality, this genocide of hundreds of thousands (and still counting) is (also) supported by the UN, World Bank, IMF and Britain. You won't find this in the mainstream media, but how could you know when you simply close your eyes for what's going on? hoi.polloi » January 22nd, 2018, 5:16 pm wrote: As horrible as the crimes of empire are, what can be relied on in your alarmism and your obvious desire for us to let your cherry-picked pieces go completely unquestioned/gawked at/emotionally reacted to? If you don't even try to understand what's going on in the Middle East, you won't ever understand 9/11. Are you suggesting to look the other way when hundreds of thousands of Yemenis are dying under the guise of bringing freedom and democracy? Firestarter » January 22nd, 2018, 12:10 pm wrote: If you don't even try to understand what's going on in [ . . . ] you won't ever understand 9/11. Are you suggesting to look the other way when [ . . . ] are dying under the guise of bringing freedom and democracy? Aren't there other forums for you to post this information, assuming this is a true representation of the facts of reality? This forum is for the dissecting of media (mostly mainstream) reports of whatever sort, in order to help wake up the hypnotized people to see that we are being bamboozled with "Stories (fish tales) of the Day." If what you are stating here is the truth of the matter, then there are other venues for it. If what you are stating here is NOT the truth of the matter, then point out to us the falsehoods, with references for backing up your view, if possible or needed. Please don't litter our forum with fear-mongering news articles. Firestarter » January 22nd, 2018, 1:10 pm wrote: If you don't even try to understand what's going on in the Middle East, you won't ever understand 9/11. Hunh? Why do you equate the Middle East with 9/11? Do you actually still believe Middle Eastern bad guys attacked the U.S.? Isn't this forum the last place on earth that would welcome such a view? Iran couldn't even get weapons to Yemen if they wanted to, because it is blatantly blocked. False, 50% of Yemen’s border is surround by water and not easily patrolled. Super easy to smuggle nearly anything one desires into Yemen. One of my American friends, Sarah, snuck into Yemen, twice, along with 4 mercenaries and loads of weapons in an attempt to retrieve her 2 children taken by her Yemeni ex-husband. Failed at both attempts. Problem was that Sarah and those 4 mercenaries were out gunned both times so to avoid a shoot out in which the children would have been at the center they chose to give up. Sarah and the 4 mercenaries were lost at sea on their last return trip home and presumed dead. Children eventually came to the United States to go to college. Time won. I guess my point is if one has the money and will, anything can be smuggled into Yemen. Weapons blatantly blocked? Not bloody likely. HonestlyNow » January 22nd, 2018, 6:34 pm wrote: If what you are stating here is the truth of the matter, then there are other venues for it. If what you are stating here is NOT the truth of the matter, then point out to us the falsehoods, with references for backing up your view, if possible or needed. We can agree that what I claim is either: 1) true or 2) false. I won’t go into the possibility that it’s false: basically all the information that I’ve found on this confirms that literally millions of Yemenis are in (danger of) severe starvation. I have pointed to falsehoods in the official narrative, in particular hiding the role of IMF, World Bank and UN, which all support this mass murder. Do you have any idea what it means when a population has no food to eat, or clean drinking water, but our “humanitarian” organisations provide Yemen with vaccines for cholera? There isn’t a single good estimate on the death toll. The death toll that is mostly given is between 10,000 and 15,000, which is really a sick joke. 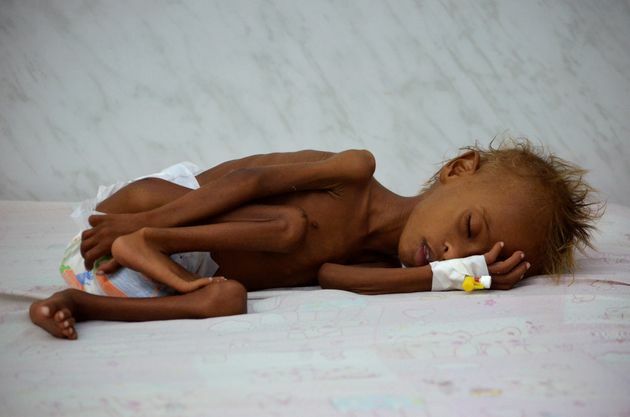 There have been some examples of a population dying of starvation in the 20th century, for example the Holodomor in 1932-1933 in the Ukraine, some of which exceeded millions and as far I can tell the same thing is happening in Yemen at this moment. The estimates of one dying child per 10 minutes (more than 1,000 a week) in 2016, and 1 child per 5 minutes by now (more than 2,000 a week) seem reasonable estimates based on the information I found. I estimate that at least 250,000 Yemenis have died from “preventable causes” since the war against Yemen started in March 2015. One of the biggest present scandals is the genocide of Yemen. If most people have never heard of this, I say that this immediately confirms that a major media cover-up is in action. From my point of view, the relatively small false flags serve to divert the attention from the big scandals. After 9/11 was staged literally within a day USAma Bin Laden, Al Qaeda, Afghanistan and Iraq were accused. In retrospect I find it surprising that it took so long to invade Iraq. A lot of people DO appear to realise that Iraq was mostly about oil, and that the same people who pushed for the war not only profited from the oil but also from “rebuilding” the country. Only recently I found out that Iran has been found guilty for a variety of false flags against US citizens (including 9/11 and some others that were first blamed on Al Qaeda) and sentenced to pay more than $50 billion. Iran has also been accused of aiding the Houthi rebels that have been blamed for the “civil war” in Yemen. Kham » January 23rd, 2018, 6:55 am wrote: I guess my point is if one has the money and will, anything can be smuggled into Yemen. Weapons blatantly blocked? Not bloody likely. People with money, can still get sufficient food and drinking water, even in Yemen. The Houthis are active in what used to be North Yemen (which looks more like West Yemen...). There is no possibility to import by planes, there are US warships patrolling the seas, and there are fighter jets that bomb Yemen on a daily basis. Smuggling, at least on a large scale, is only possible with the help of the authorities. The biggest drugs trafficking operations take place with the aid of intelligence agencies. In Afghanistan there’s ample evidence that the armies present (including of the US, Britain and the Netherlands) have blatantly been protecting, patrolling the poppy fields. 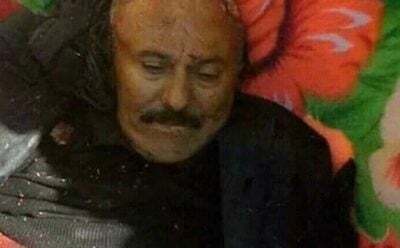 Ali Abdullah Saleh's death - is it a hoax? I haven’t found a single story on the whole internet that shares my view that this death is probably completely fake. Besides that I’ve seen no evidence at all that Salah has died, it’s unlikely that he would have been killed so easily by the Houthis. I'm not convinced by the picture for “evidence” of the dead Saleh. On the top right is a wound that shows suspicious little blood. Besides stories that confirm that he was killed by the Houthis, and the video that could be fake, his ID card (in the hands of a Houthi?) has been presented for evidence. There are contradictory stories on how he died. He was either killed in or outside Sanaa; in or out his house; either by sniper fire or with a RPG rocket and then shot from nearby…. The Al-Mithaq newspaper affiliated with Mr Saleh earlier denied "rumours" of his death. Reuters quoted a source in Saleh’s General Peoples Congress (GPC) as saying he was killed by sniper bullets. Sources in the Houthi group said fighters stopped his armored vehicle with an RPG rocket and then shot him dead. A member of the Republican Guard and one who was in the tight security circle of former Yemeni president Ali Abdullah Saleh, first lieutenant Ali Abduh al-Faqieh, informed The Media Line that Saleh was actually killed in his home in Sana’a on the early hours of Monday morning at around 4:00 am when he was attacked by Houthis. Close inspection of the circulated video and photos of his dead body indicate that his head shot was caused post mortem and that the gunshots on his abdomen were probably what lead to his death. Photos also indicate that his hands are handcuffed to his back when he was heaved on the truck in the circulated video. There have been speculation as to why this cunning meticulous leader who ran Yemen for over three decades was traveling without much security and was caught easily by the Houthis. Maj. Gen. Abdelwahab Dahab, a Houthi commander, said Houthi fighters had learned that Mr. Saleh had fled the capital and so had set an ambush in the desert for his vehicles. “The moment he appeared, they took a violent turn in an effort to flee but they were quickly overwhelmed by our gunfire,” General Dahab said. But a tribal leader in Sana who supported Mr. Saleh said that Houthi forces had killed him during the raid on his house, and had taken his body into the desert to make it appear that he had been fleeing like a coward. Michelle Nunn of Care USA, estimates that “A child dies in Yemen every 5 minutes”; more than 2000 per week, more than 104,000 per year. The biggest arm suppliers to Saudi Arabia, are: 1) the United States with 52.0% and 2) Britain 27.1%. the largest famine the world has seen for many decades with millions of victims. The French Doctors Without Borders (MSF) reported that its flights were denied clearance into Yemen for 3 days. In a press conference earlier this month, the Yemeni Ministry of Health says that because of the war against Yemen, 52,000 children died in 2016 for preventable causes. That’s 1000 every week, almost a child every 10 minutes. Some 35,000 Yemenis were killed or wounded by airstrikes since the war started in March 2015. That’s about 35 people every day. The war by the coalition has also triggered a cholera outbreak that has killed 2,236 people so far. Because of the ceaseless aggression, more than 55% of the health facilities don’t function, and the remaining 45% operates with a minimum capacity. As a direct result of the airstrikes, 415 health facilities have been destroyed, either completely or partially. 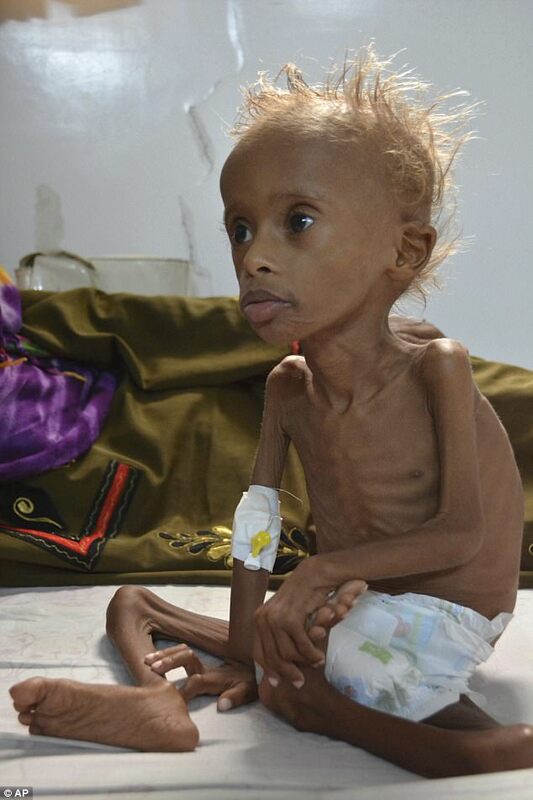 Some 2 million Yemeni children suffer from malnutrition, of which half a million are dying of starvation. The war in Yemen is sadly a war on children. Yemen is facing the worst humanitarian crisis I have ever seen in my life. UNICEF in its greatest philanthropic disguise has flown 1.9 million doses of vaccines to Yemen to vaccinate 600,000 children against diphtheria, meningitis, whopping cough, pneumonia and tuberculosis. 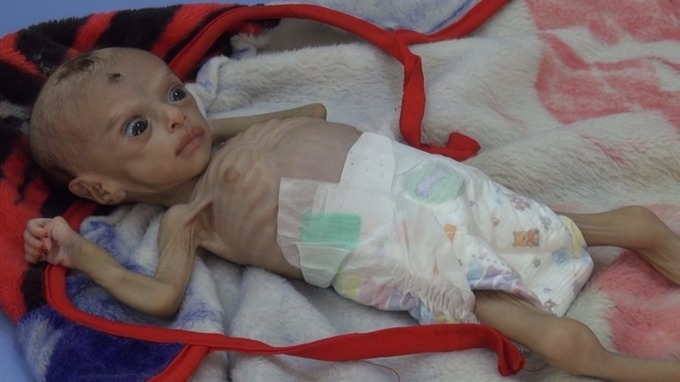 See what Yemeni children dying of starvation look like. On Monday, the coalition shut air, land and sea routes into Yemen after Houthi rebels fired a missile that was intercepted near the Saudi capital, Riyadh. Saudi Arabia says its blockade is needed to stop Iran from sending weapons to the rebels. the decision by Saudi Arabia or the Saudi-led coalition to impose a total blockade means a death sentence that will kill all Yemenis. They have one cousin or one brother or one relative who died because of—if it’s not under the Saudi-led airstrikes or the shelling of the Houthi and Saleh forces in Taiz and other disputed areas, the shortage, the extreme lack of medicine and food and healthcare have—you know, I’ve lost count of how many relatives that I know, or friends of friends and relatives of my friends, who died because of the implication caused by the conflict. Myself, I lost my aunt two years ago. Just last week, I lost also another two relatives, distant relatives. And all were not victims of the airstrikes, but they were victims of the blockade and the shortage in medicine and the total collapse of healthcare. And no question that the U.S. has its hand in what’s going on in Yemen. They are a participant in creating, you know, the world’s largest humanitarian crisis. They are a participant in creating the largest famine that we will see, that the U.N. official was talking about earlier. I think the U.S. administration has to admit that it is giving its political backing to the Saudi-led coalition. It has given its, you know, support with the arms sales and the intelligence and logistic assistance to the military operation, plus even with this total blockade. The U.S. Navy has about 80 percent control over the ports to Yemen. Actually, there are many participants in what’s happening in Yemen. Absolutely, it’s Saudi Arabia and the members of the Saudi-led coalition, and also other Western countries that are directly involved in, you know, the military operation. So, all these countries have responsibility to, you know, to uphold the human well-being, before their—the political and military gains that they are looking for. Destruction of access to food and water constitutes a war crime. The British government has approved more than £4.6 billion in fighter jets and arms sales to Saudi Arabia since their war against Yemen began. The UK’s “deputy prime minister” Damian Green explained: “our defence industry is an extremely important creator of jobs and prosperity”. More than 8 million Yemenis are now facing famine after Saudi Arabia tightened a blockade on the country on 6 November. Restrictions were slightly eased on 26 November, so that vaccines could be delivered to the starving population. The Saudis target them [the polytunnels]. They were afraid the planes would come back, bomb us and kill their families. There was another (hypothetical) way the Yemenis could get food – fishing. The Saudi Air Force is trained by the British Government to assist in the atrocities in Yemen. Defence Minister Michael Fallon, who was forced to resign on 1 November month over some sexual harassment scandal, said the Royal Saudi Air Force was helped to “improve their targeting processes” and compliance with “international law”. 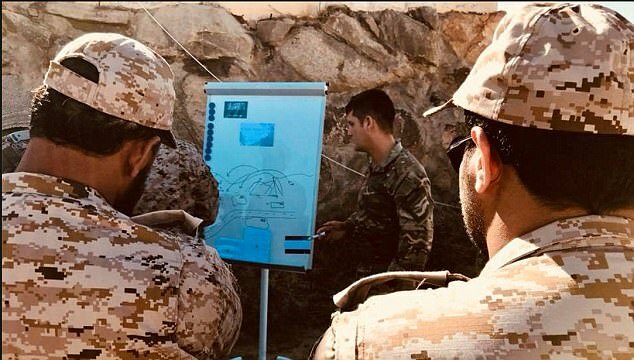 As part of our ongoing defence engagement with Saudi Arabia, the UK has provided training to the Royal Saudi Air Force (RSAF) both in the UK and in Saudi Arabia, including international targeting courses for RSAF personnel, to improve their targeting processes and to support International Humanitarian Law (IHL) compliance. Every hour, 27 children are diagnosed as acutely malnourished: that’s 600 more starving children every single day. UNICEF predicts that 150,000 children could die by the end of 2017. An estimated one million children are facing starvation as a result of the war against Yemen. Fuel shortages mean at least 7 cities have no clean water and sanitation. As part of Operation Crossways up to 50 UK military personnel have been teaching Saudi soldiers to improve their mass murdering skills. I’ve actually based some of this story on the information from the UN. At least one child dies every 10 minutes in Yemen. That’s the conclusion of a report just published by the U.N. children’s agency, UNICEF. The report also found that there has been a 200 percent increase since 2014 in children suffering from severe acute malnutrition, with almost half a million affected. Nearly 2.2 million children are in need of urgent care. Over 5,000 children have been killed by Saudi Arabia's war on Yemen since it began in March 2015, says a report by the UN children's agency. The report published by UNICEF on Tuesday, noted that the Saudi war had killed "an average of five children every day since March 2015." More than 13,600 people have been killed since the onset of the Saudi-led war on Yemen in 2015. There’s no denying that saying “the Saudi war had killed an average of five children every day since March 2015” is a blatant falsehood! From March 2015 to September 2017, coalition bombs targeted 356 farms, 174 market places and 61 food storage sites. According to emeritus professor Martha Mundy at the London School of Economics, in the first 15 months of the “coalition” bombing campaign of Yemen there was “strong evidence that coalition strategy has aimed to destroy food production and distribution” in areas controlled by the Houthis and/or former president Ali Abdullah Saleh (who’s reportedly been killed by the Houthis). That would be a clue.